Make Your Garage Door Last Longer. 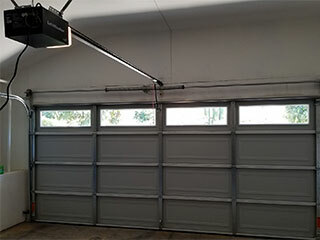 There comes a time when every part of your garage door will lose its functionality and will need to be replaced. However, a lot of components can last far longer when they receive an adequate amount of maintenance. Your automatic system is a complex machine that needs some attention and care in order to keep serving you loyally and safely. That's where our team comes in. Over time, the load-bearing parts that help your door move up and down will begin to wear out, and they will eventually break if you don't get them replaced in time. By having our experts adjust the tension of your springs every so often, you'll be able to alleviate some of the stress they go through, and make them last longer than what their current state will allow. Spring adjustment is no simple task, so you should let our experts handle it rather than attempt to do it yourself. You could get seriously hurt if something goes wrong, so it's better to let the professionals handle this task. There are a lot of different hardware parts that need to be checked every so often in order to make sure they're holding up. Our technicians will check for panel dents, damage to your tracks and even fraying sections on your cables. We will repair any minor damage we find immediately, and replace any too-far-gone part before it creates a major problem. Your opener has special features that make it reverse when you or an object get in the way of the closing door. These features need to be tested to ensure that they're working correctly. A garage door can weight over two hundred pounds, so you definitely don't want to be caught under it all of a sudden. As part of our maintenance service, we will check the alignment of the opener's photo eye sensors, and adjust them if they fail our test. We'll also make sure that the force limit is set correctly, and that the auto-reverse mechanism is functioning properly. This is very important as without these features your safety could be compromised. Don't wait for your door to start falling apart. Contact our team at Garage Door Repair Wilmette and let our technicians ensure that you can keep using the system for a very long time.